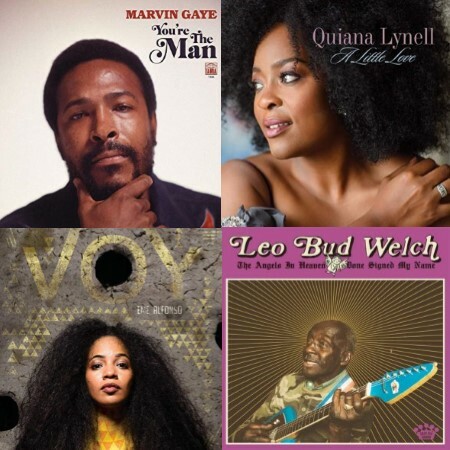 Welcome to the April 2019 issue of Black Grooves, sponsored by the Indiana University Archives of African American Music and Culture. Our featured title this month is Marvin Gaye’s previously unreleased Tamla/Motown album, You’re the Man. This new expanded edition coincides with the 60th anniversary of the Motown label and Marvin Gaye’s 80th birthday. In celebration of Jazz Appreciation Month and International Guitar Month we’re featuring a wide variety of new releases: Christian Scott aTunde Adjuah’s Ancestral Recall, Branford Marsalis Quartet’s Secret Between the Shadow & the Soul, Kendrick Scott Oracle’s A Wall Becomes a Bridge, Brent Birckhead’s debut album Birckhead, the Eric Dolphy 3-disc compilation Musical Prophet, the compilation On the Corner Live! that reimagines of the music of Miles Davis, Anu “The Giant” Sun’s multi-genre solo debut Sanguine Regum, emerging jazz vocalist Quiana Lynell’s debut A Little Love, the compilation A Day in the Life: Impressions of Pepper that reimagines the Beatles’ most famous album, the urban jazz release Bob Baldwin Presents Abbey Road and the Beatles, rising Cuban star Eme Alfonso’s Afro-Cuban jazz fusion album Voy, noted 7-string guitarist Ron Jackson’s Standards and Other Songs, an expanded edition of The Lightmen Plus One’s 1972 masterpiece Energy Control Center, and Basin Street Records’ 20th anniversary celebration Live at Little Gem Saloon. Also featured this month is Mississippi blues guitarist Leo “Bud” Welch’s posthumous release The Angels in Heaven Done Signed My Name, and previously unissued live tracks from blues singer and slide guitarist Johnny Shines on The Blues Came Falling Down – Live 1973. Wrapping up this issue is our list of March 2019 Black Music Releases of Note. This entry was posted in African American Culture & History and tagged album reviews, April 2019, Black Grooves, black music, International Guitar Month, Jazz Appreciation Month, March 2019, Marvin Gaye, rew releases by aaamc. Bookmark the permalink.